With a whole week in London, we vowed to do more touristy things than our usual brewery to pub to brewery routine. Despite it being February, I hoped we could even get in some outdoor activity. 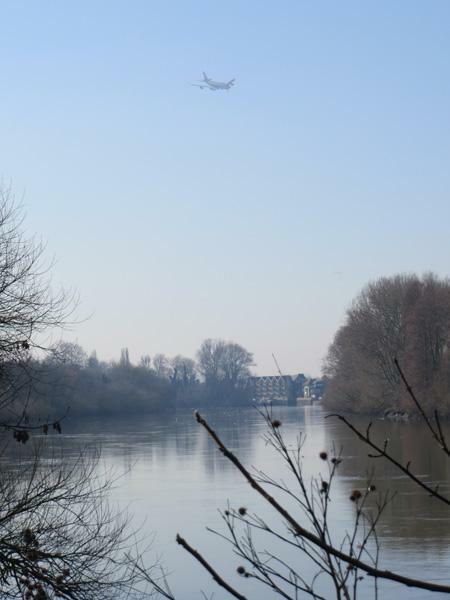 A 3-mile walk from Richmond to Kew Green along the Thames was exactly what I had in mind for mid-winter outdoor fun. And there was even a brewpub at the end. Alighting the train at the Richmond tube stop in the town center, Merideth and I got our bearings and followed the signs for the Thames riverfront. Being half-term (a time when kids are out of school), affluent Richmond bustled with families walking its streets. Within just a few minutes, we were walking along the river towards Kew Green. 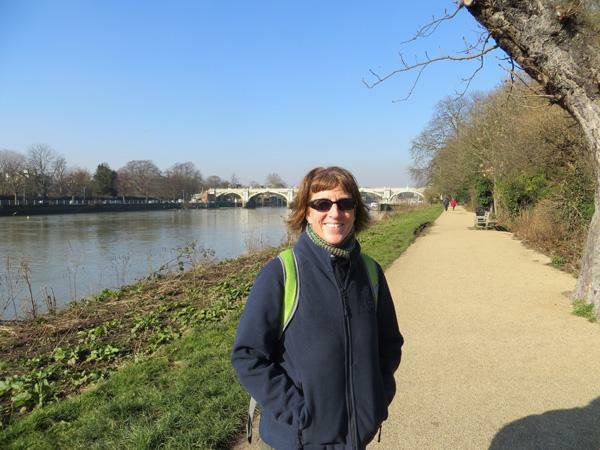 As luck would have it, the day we chose for our Thames walk was the nicest of the trip. With temperatures seemingly approaching 50°F, I wondered if I should have worn the one pair of shorts that I had packed. Merideth, however, thought I was a bit daft, as it really wasn’t THAT warm. Once we left the crowded path around Richmond, we were flanked on the left by the Thames and on the right by Old Deer Park, a huge expanse of green. Meandering through intermittent woods, it was quite tranquil, except for the constant roar of air traffic landing at Heathrow about ten miles away. Following along the Thames, the path teemed with bird life. Swans, geese, ducks and especially gulls were prevalent in the water and along the shore. Egrets were nesting high in trees or hunting along the water edge. We heard the shrill of a parrot, something very familiar in our household. 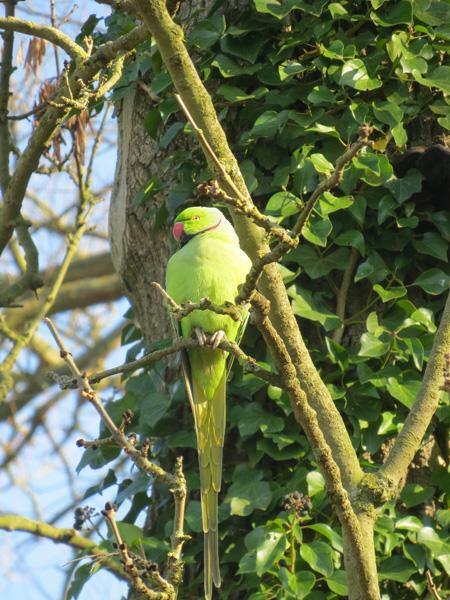 Apparently, the Richmond area is home to a large population of green parakeets (not our kind of parakeets, these are medium-sized parrots). Our ornithology adventure culminated with seeing a kestrel, a few feet away, unsuccessfully nab a rodent and then sit on a fence long enough for me to snap a photo. Eventually, we reached an open space with family-filled picnic tables. Signalling our return to civilization, this was the famous Kew Gardens. Off in the distance at the end of a long, narrow green, we could see the iconic Palm House. Soon we passed the large parking lot and a short time later, we arrived at Kew Green. Its large open space and country village-like feel made it hard to remember we were only a few minutes from central London. 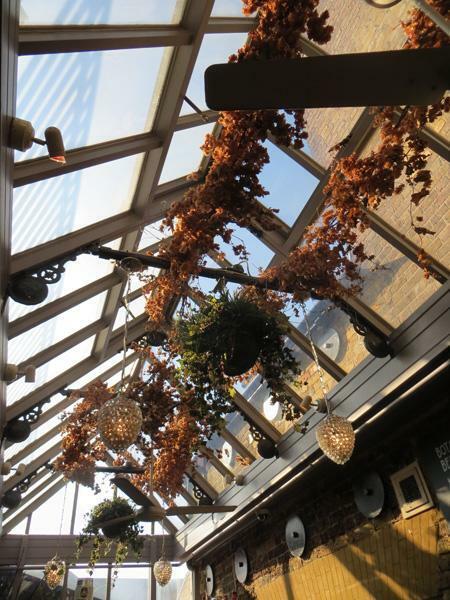 Directly across Kew Green was our reward, The Botanist, an aptly named brewpub. Arriving a bit past noon, we were the first customers of the day. A glass atrium filled with dried hops dominated the entrance with a bar of hand pumps underneath. All manner of signage filled the room, telling us about being brewer for a day, explaining our three glassware choices, and to keep calm. We settled at a high table just across from the bar and ordered a five beer flight. The brews ranged from a golden-hued Wheat, Kew Green, to Nemophila, a deep-brown Stout. To remind us we were in England, there was Maximus, a 5.8% ABV “Imperial” Red. All the beers were solid. 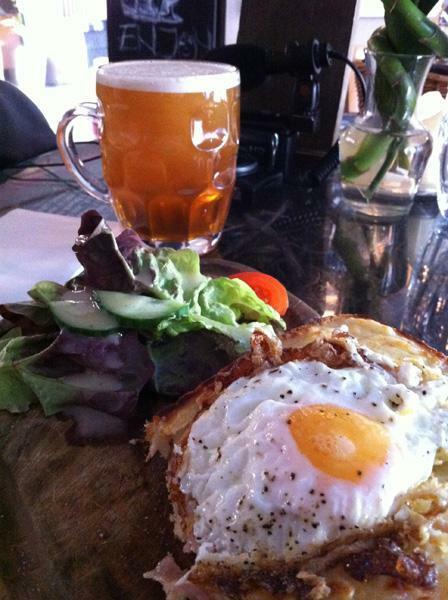 With my yummy Croque Madame, basically a grilled cheese sandwich with fried egg on top, I paired the Humulus Lupulus. If it had been brewed in the States with a name like Humulus Lupulus, the brew would be a 10% ABV bomb hopped to the hilt with every trendy hop. At The Botanist, it was an easy-drinking, brightly-hopped 3.8% refresher. Merideth, also enjoying the Croque Madame and paired it with “65”, a malty, deep amber-colored English Mild. Lunch and beers finished, we needed to head back to central London. It was a short walk to the Kew Gardens tube station thus completing our walk. I could easily see us repeating this walk in the future, especially on a nice summer day.